Predator pressure is normally very difficult to assess, and most reports tend to be anecdotal. However, it has been estimated that an annual predation rate of 25% may apply to Microcebus populations (Goodman et al., 1993). Such a rate, albeit for a particularly small prosimian, implies strong selective pressure in favor of adaptations that reduce predation, and it seems reasonable to assess adaptations with predation in mind. Predator avoidance by vigilance is usually seen as an attribute of social foragers (see, e.g., Terborgh & Janson, 1986), to which category many of the Lemuridae, and arguably some Indriidae and Lepilemuridae, belong. 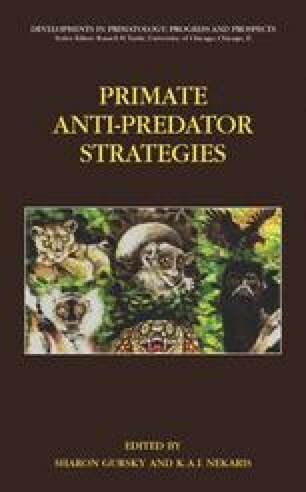 However, the small body size and nocturnality of those prosimians described as “solitary foragers” are often regarded as facilitating alternative predator avoidance strategy, crypsis (e.g., Clutton-Brock & Harvey, 1977; Stanford, 2002).